EDIT – This information is now out of date. Read the comments for information about ootunes – an excellent iPhone app and the most painless way to get a huge assortment of NHL game radio. Happy Stanely Cup Playoffs hockey fans! 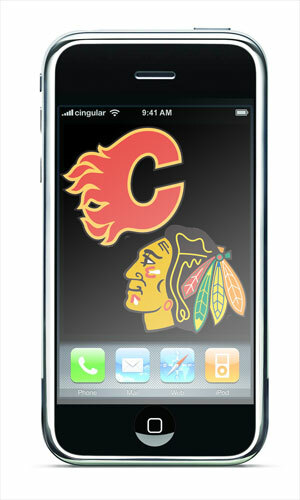 By far the most popular thing I have ever written on this blog was this little throwaway post on how to get Calgary Flames game radio via the iPhone. Since traffic to that post remains absurdly high, (and most of the other information on that page is now obsolete) I thought I’d celebrate round one of the playoffs with a succinct version – not just for my hometown Flames – but also our round one nemesis – the Chicago Blackhawks (yes, the same Blackhawks of the great all-star voting ads with the mixed marketing message). I will keep updating this information for every opposition team the Flames face – giving fans of other Western Conference teams a reason to cheer on the Flames. In the (admittedly unlikely) scenario that the Flames manage to overcome a slew of obstacles to get through the first round – I want Blackhawks fans to be able to listen to every. Single. Second. Download and install the application FStream (either by clicking this link, or searching for it in the app store). For Calgary Flames Radio – enter mms://38.99.208.186/fan960?MSWMExt=.asf in the URL Box (be careful about capitalization and punctuation – they’re important). Then click “save”. For Chicago Blackhawks Radio – enter http://www.provisioning.streamtheworld.com/pls/WGNAM.pls in the URL Box (be careful about capitalization and punctuation – they’re important). Then click “save”. You’re done! Click on “play”, and your station should appear on the main screen. Tap it, and your iPhone will connect to and start streaming that station! Enjoy – and (regardless of rooting interest) have a great playoffs all! Once you get this up and running on your phone, click this link and send a couple of bucks to j.averous@sourcemac.com – the genius behind FStream, which makes this all possible. Seriously this is major software he’s just giving away. Given that we’ve all spent money on less than stellar apps, support those giving away their hard-work by throwing them some beer money. Knowing the French, he probably doesn’t even like hockey! Thanks a lot. I’ve been looking for this info! The Hawks / Canucks series should be an exciting one. What do I punch in for am 1040 help I needto attend a function on Thursday and need to listen to game 4!! The Team 1040 has instructions for the iPhone on their site (although it’d be nice if they credited the creators of FStream). The link for the Fan 960 doesn’t work. Anyone have a new link to try? WGNAM is pretty iphone friendly – they usually update their stream location here. Hope that helps – I’m travelling so I can’t check it out myself. I’ve recently added the ability to stream flash player audio streams to my iPhone app (ooTunes radio). This means that all the live audio streams from nhl.com will actually play right in the app on your iPhone or iPod touch. I’m in the process of linking to a schedule page for each nhl team (10 added so far), so you can just search the team name, it loads the page (in the app’s built in browser), then click the “listen” link to go to the nhl site and the stream will just be picked up and connect to listen. Let me know if you have any questions, problems or suggestions with it. My app is currently $5 in the app store. I feel bad I didn’t update the post right away, but ootunes is a great app – and pretty much all I reccomend now to less tech-savy individuals looking to get streaming radio (of any ken) on the iPhone. It gets the “bradfox.com seal of approval for sure”.